#45Days School and Class Readiness Programme 2017 inTS Schools AP Schools/45 days #3Rs #Remedial Teaching Programmes: A 45-day School and Class Readiness Programme 2017 has been launched in AP Schools from 15-06-2016 to 13-08-2016 as per proceedings rc.no.19. 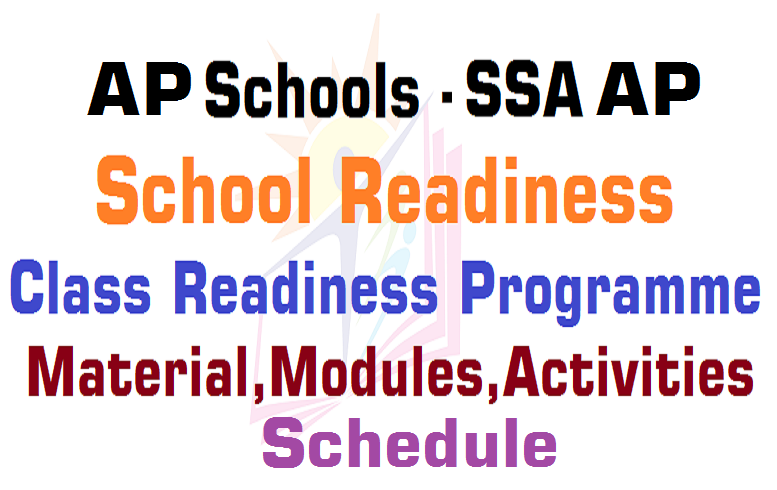 In this connection SSA State Project Director, AP has given detailed guidelines and School Readiness programme would started for Class I and II and at the same time Class readiness programme would be started for Classes from 2nd to 10th from above mentioned schedule. This proceedings details and Guidelines as follows. Guntur SSA: As per the reference above State Government decided to organize School Readiness and class readiness programme for a period of about 45 days from 15th June to 13th August 2016 (Working Days) at the Primary, Upper Primary and High School level of education i.e. from class I to X. School readiness programme is conducted for class 1 and class readiness classes from class 2nd to 10th of Telugu & Urdu Medium Schools including KGBV,OERCs and model Schools in the State. In this context Telugu guidelines are enclosed for organize School Readiness and Class readiness Programme. Therefore all the Mandal Educational Officers in the district are instructed to strictly follow the instructions and guidelines enclosed (Ten Pages) for organize School Readiness and class readiness. Further they are instructed to inform all the H.Ms to maintain CPAR in their schools. SSA,A.P, Hyderabad-Pedagogy -Launch of a 45 day programme of school readiness for class I&II and class Readiness for class II to X across the state in Telugu and Urdu medium schools from 15th June to 13th August, 2016. The AP State AWP&B for 2016-17 has proposed to continue the school Readiness and class readiness programme during the next academic year i.e. 2016-17 for a period of about 45 days from 15th June to 13th August 2016 at the Primary, Upper Primary and High school level of education i.e. from class 1st to 10th. More specifically for School readiness is proposed for class lst and 2nd and class Readiness classes from 2nd to 10th of Telugu and Urdu medium schools. In this connection, on the lines of the recommendation of the PAB, focus is given to acquisition of basic language skills(LSRW) and Mathematical skills (4 Fundamental Process) to the children of classes 2nd to 10th of Telugu and Urdu medium schools and all Government schools including KGBV, IERC and model schools. In respect of school readiness, teacher will take up relevant playful activities in order to make the child ready Psychologically, Physically and sociologically and also to receive the instruction more in an informal way. The MHRD has given emphasis on the early literacy skills and basic Arithmetic skills among the children in the Phade Bharat and Bhade Bharat programme further the following activities are prepared and suggested for implementation of the programme concept wise. DRPs, DLMTs and Mandal level Teams with MEOs, school complex HMs and MRGs, CRPs to monitor the School Readiness and Class Readiness programme at district level and mandal level respectively for an effective monitoring of the implementation of the School and class readiness programme The consolidation observation report should be sent to the state office. To monitor the programme at the state level, State level observers may be sent to respective districts with instructions to spend at least 2 days in 3 spells during the programme schedule in the district allotted. The DPOs of the SSA of the districts are requested to provide accommodation and transport facility to the state level observers. The District Educational Officers, the Project Officers of SSA, and the Principals of DIETs in the state would take up necessary steps to conduct the school Readiness Programme and Class Readiness Programme effectively to attain the set objectives of the programme. 2. After lunch readiness programme anduse last 3 years modules. 3. Teachers must use cards, essay English cards, snehabala cards ,balasahithyam, summer badi module, etc.